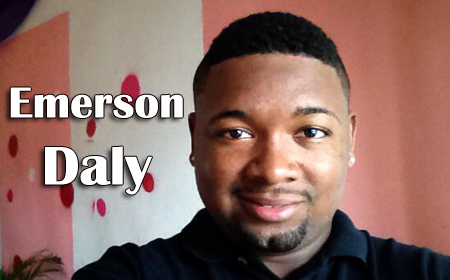 ROARING CREEK, CAYO, Wed. Jan. 21, 2015–The search for Emerson Daly, 24, a well-known resident of Roaring Creek, came to an end at about 8:30 this morning when his decomposing body was found in the Belize River, in the Never Delay area in the Cayo District. He was found floating face-down. Daly had been stabbed multiple times, shot in the face and thrown into the river. He was found on the third day after he reportedly went missing, on Sunday. At about 7:00 this morning, five of his cousins and friends got into a boat and began to search for him on the Belize River in the area of Roaring Creek, along the edge of the river, when at about 8:30 they found his body, down the river, about two miles from Roaring Creek, in the Never Delay area. 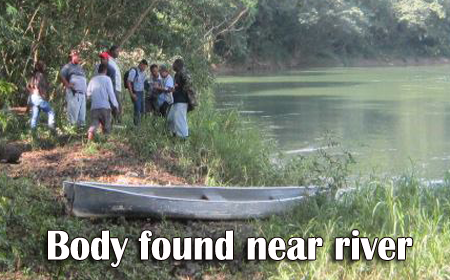 Belmopan police, who were also searching in the area, were alerted, and Daly’s body was retrieved from the river and taken to an area where an onsite post-mortem was conducted, after which he was buried at the Roaring Creek Village Cemetery. Police believe that Daly was killed elsewhere and thrown into the river. The death has been declared a murder, and an investigation has begun. Daly’s family told police that he left home in Roaring Creek at about 8:00 Sunday night, after telling them that he was going to Belmopan and that he would return shortly. He had borrowed his uncle’s vehicle, because his vehicle was having mechanical problems. The family reported seeing him in the company of another person, a man whom they could not identify, when he left in his uncle’s Nissan Pathfinder. According to his sister, when he left the house he was dressed in a white undershirt, a pair of khaki pants and slippers. However, Daly did not return on Sunday night or on Monday. 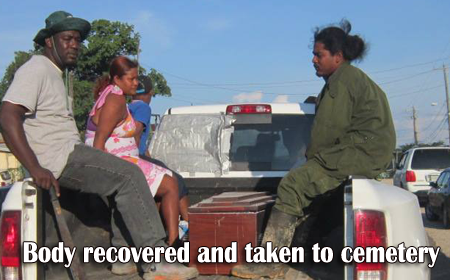 The family became worried, especially after calls to Daly’s cellphone went unanswered and on Tuesday, they went to Belmopan police and filed a missing person report. Police say that at about 10:00 yesterday morning, Tuesday, they found the Pathfinder on Mount Pleasant Road between Miles 46 and 47 off the George Price Highway, near the river. No one was in the vehicle but they saw blood on the backseat and there was a bloody undershirt along the Cohune Walk Trail in an area not too far from the vehicle. They searched for Daly, but he was nowhere to be found. The family then realized that something serious may have happened to Daly, so the family and friends came together and began to search for him in the area near the river. Their worst fears were realized when his body was found floating in the river this morning, Wednesday. Daly’s family still cannot think of any reason for his senseless death. His sister said that Daly had a calm and friendly temperament and was not known to have any enemies. So far, no one has been arrested or detained for the murder. The police have eliminated robbery as a possible motive for his murder. 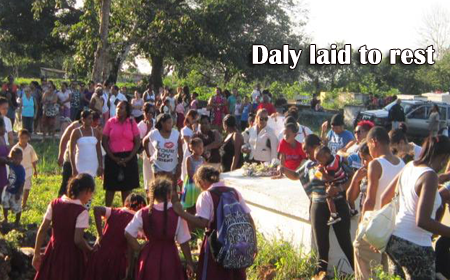 The post-mortem conducted on Daly’s body certified that his death resulted from a gunshot wound in the face.